After 2 days flying across the world, we finally arrived! We were now few miles away from where some of the last Sumatran orangutans survive. Maybe a mother and her infant were even peeping through the canopy across the river right when we were opening the door of our guest house room. Our reason for coming was primarily to help researching the special behavior and ecological conditions necessary to maintain health in wild orangutans, using parasitic infections as a measure of this health. 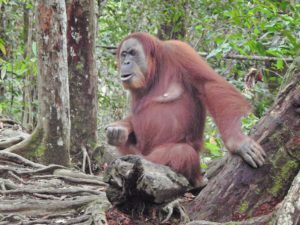 But it was also to observe how ecological and ethical Orangutan tourism is and specifically in the surroundings of the small yet very touristy area of Bukit Lawang (BL or Bukit for short). We focus here on what we started with: a few-days trek in the jungle in the company of guides from a small ecotourism organization. The trek was not centered on orangutan tourism, and we had not planned it this way. But it ended up providing us with the perfect venue to understand better what are the positives and negatives of red apes tourism. Can it ever qualify as ecotourism? sustainable tourism? 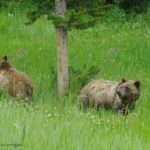 or is it rather plain ‘wild’ tourism – that is, a form of tourism focused on the interaction with wildlife without necessarily carrying a sense of responsibility to the environment or local communities. Dan and I arrived by night in Bukit Lawang. 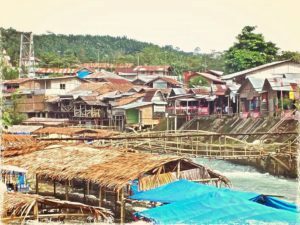 It is a small and charming village on the banks of the Bahorok river in the North Sumatra province of Indonesia. After 2 days of traveling across the world, we were more than happy to put down our backpacks and sip on the welcome tea of our kind host. The time to briefly discuss the logistics of the trek that was to begin the day after, to shower and we were ready to catch up on our sleep. In a matter of minutes after hitting our pillows, we were sound asleep despite the roaring of the river few feet down our spartan room. A day later, in a company of our lead guide and his small crew, we were on our way. Less than half an hour after leaving the village, we were entering that famous forest that had sparked our imagination for years: the Gunung Leuser National Park, home to the very last and rare Sumatran orangutans. The name “orangutan” is derived from the Malay and Indonesian words orang meaning “person” and hutan meaning “forest”, thus they are persons of the forest. Orang Hutan was originally not used to refer to apes, but to forest-dwelling humans. Orangutans are disappearing rapidly as the results of deforestation (mainly due to timber and palm oil related activities), human-wildlife conflicts (i.e., the interaction between wild animals and people and the resultant negative impact on people or their resources, or wild animals or their habitat), diseases, and other very human-caused reasons. We had chosen Bukit in the first place because of its closeness to the wildlife veterinary base camp that we would join a week later. 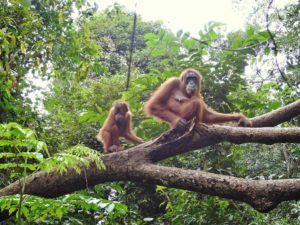 But Bukit is first known for the famous Bohorok Orangutan Center that hosted an official orangutan rehabilitation project from 1973 to 1995. It was terminated when the Sumatran Orangutan Conservation Program (SOCP) established alternative rehabilitation centers, which decoupled rehabilitation from tourism and forbidding close contacts between tourists/volunteers and orangutans. Why were those interactions banished? Simple: despite our human wish for direct interactions with orangutans to be harmless, they can be detrimental even dangerous to the animals, if not us [RA14]. Direct interactions over-habituate them, and consequences include increased stress and aggression levels, diminished mothering skills (e.g., neglecting the training of their infants, which is necessary so they can acquire the jungle skills needed to survival), decreased survival rates when released. To add to this list there is also the issue of the transmission of diseases in both directions (from humans to orangutans and vice-versa), of course potentially more catastrophic when it is from us to them [FI10]. All that is not news anymore: it has been studied and known for a couple of decades at least, and the evidence keeps accumulating. Getting to the details of anthroponotic diseases (those diseases passing from humans to wildlife) is actually what we were targeting when we enrolled in a wild veterinary citizen science opportunity in the first place. Oddly, despite years of knowledge about the problems of close animal-humans interactions, tourists are fundamentally oblivious or dismissive about them. Instead, the prospect of easy access to a sighting of our disappearing siblings translates into hordes of visitors from all over the world attempting to get as close as possible to orangutans in their natural habitat –too often in the hope to touch one or to snap that famous selfie that might get viral among our friends (no pun intended). But doing so we further the issue, we accelerate the pace of the disappearance of a critically endangered species. Are these isolated cases? No, and diseases transmission is very real and widely acknowledged by experts and practitioners [HZ03]. Sadly we have to report that each time that we witnessed a human-orangutan encountering, something happened that disregarded the well-being of those animals–e.g., too close, too loud… It is hard to blame people though: most have no ecological knowledge of what they are looking at. Besides they only replicate what they do at home in zoos and other animal captivity settings which exhibit animals at unnatural distances. Seeing our first semi wild came at a surprise. Half an hour before when our guide asked us to empty our bags, it did not register that we would see an orangutan. Truly I did not realize that we would see any orangutan on our first day. My focus when I interacted with the eco tour operator was to make sure that their ethics was as irreproachable as possible, including respecting wildlife (e.g., no collection of wildlife, proper trail and camping etiquette), and did not allow close interactions of any sort with orangutans or any other wildlife. Orangutan tourism was not the purpose of this jungle trek, that we rather intended as an exercise to get us fitter and more familiar with a habitat and its wildlife that we would roam a week later when tracking wild orangutans for collecting critical data. I was so busy preparing for our citizen science mission, that I had forgotten that Bukit Lawang has a population of over habituated semi wild orangutans residing around and that any jungle trek starting from Bukit begins with an orangutan stop. Over habituation. Food dependence. Unsuited human diet. Luring them down from the canopy. Pesek is such a beauty! We haven’t many details about her personal story, or how she ended up in the Bohorok Center years ago. We suspect one of the few known scenarios: caught at a young age, her mother killed so that the poacher(s) could get to and sold the infant (her) to become an exotic pet. Or maybe she was as the result of the human-wildlife conflict in the vicinity of a palm oil or timber plantation. She survived all that, got rescued and then released. Here she was in front of us with a baby. Of course, it is quite emotional to be in their presence, but when you dig a little or peep behind the touristic curtain, this feeling of wonder turns to sadness. The sadness, in this case, is about what is happening to her and her infants now in this corner of the forest. I reached out to my backpack to get my camera out. Our guide warned me to do it very slowly and further away so as to avoid exciting Pesek. Pesek is always on the look for what comes out of your bag. It might be food! This is a big issue. Pesek spends much of her time doing just that: looking for our food, waiting to be provisioned (by us humans). She has been recorded to spend as much as 30% of her activity time, interacting this way. 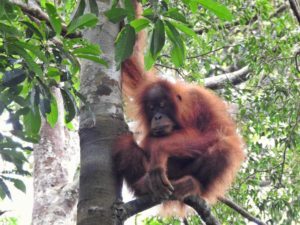 While she is waiting or interacting more forcefully with us humans to get that food (sometimes stealing a bag), she is not doing what unhabituated orangutans do: foraging in the canopy, traveling, socializing, caring for her infants, etc. 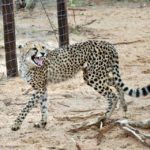 Pesek is known around and her behavior has been fairly well documented over the years. Among scientists, she is one of the study cases about the impact of tourism on rehabilitated orangutans. Somehow she is the perfect example of all that should not happen including over habituation with dependence on human food, severe behavioral changes, mothering skills issues, etc. Pesek even used to cross the river that borders the national park regularly and enter a nearby restaurant, where staff fed her to entertain the restaurant’s patrons. A behavior likely to be a self-propagating cycle of human dependence with her offsprings. Pesek must be around 40 or so now. So one could say that she has been successful so far as their estimated longevity is about 50 years. However, we can’t say the same for her little ones. 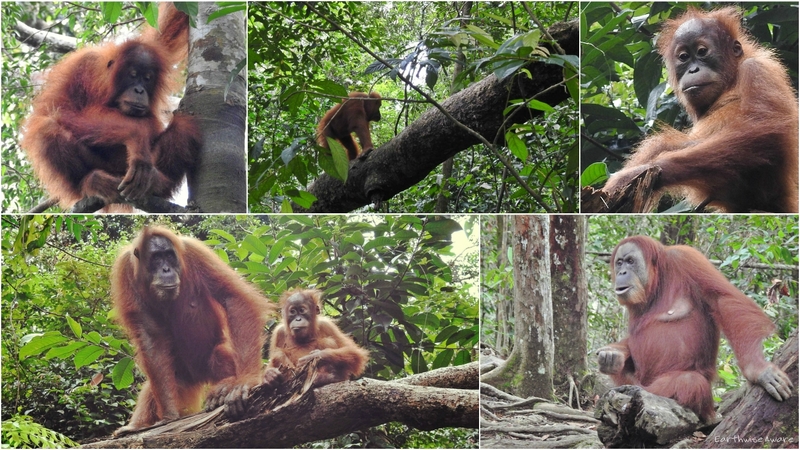 There is indeed a very high infant mortality with these Bukit semi wild mothers (compared to their wild siblings). If you were not aware of it, I hope it’s becoming clearer to you what could be the reasons for this. In any case, I’ll talk about it in further details with Borjong. Too many of us, for too long. Behavior changes. Infants training negligence. Borjong is another female orangutan from the Bohorok center. I know Borjong and her babies or infants from biology and veterinary studies. By the time we arrived in the area where they reside, a good 10 to 15 tourists were watching them in awe (of course who would not be?). With us 4 this was now a true too big crowd. Borjong and her 2 progenies (a baby and an older sibling) were up in one of the trees, and us humans were all watching up. Although people were calm, it was a clear intrusion in the sense that you had 2 groups: a big crowd of humans watching them up, them 3 watching us from above, and again nothing else happening. What I just wrote points to several major issues. The first one is the use of the word ‘reside’ to describe the area where these semi wilds live. Orangutans do not reside in one spot, they move around. And although females have a much smaller territory than the males, still they do move. These semi wilds don’t really travel, and certainly not during tourist season. They stay in one area for as long as the tourists promise to be there today, tomorrow, the day after. This is a territory range change and the tip of an iceberg of issues coming with unregulated great ape tourism. The second issue is again behavioral changes. Foraging, resting, socializing, traveling all these activities are impacted. Actually when we were looking at Borjong and her infant: there was none of that. It could have been the time of the day, but no, each time there are tourists around semi wilds, all activities stop and nothing much happen. They don’t travel, they don’t forage, they don’t rest, they don’t socialize, the mother doesn’t teach the kids, the kids don’t learn from the mother or an older sibling those skills critical to their life and survival in the forest, skills that we already mentioned take years for them to master. Instead, the activity of the mother is focused on us humans, checking which bag will open and which one of us will hand over a fruit or something else. And the little ones are busy watching an interaction that they will replicate later. In the case of the large group of people we joined, thankfully no feeding happened at the time we were there. However, it does not change few facts: we were far too many for far too long (in contrast mountain gorillas visits are limited to one group of 8 visitors maximum per day for not more than an hour at a time). Here in Bukit, groups of tourists keep coming throughout the day, increasing the risk of disease transmission as well as damaging the mothering activities, and therefore impacting the survivability of these infants. Orangutan infant mortality rates at Bukit Lawang (59%) are 8.42 and 3.47 times higher respectively than they are in wild Sumatran populations at 2 other locations, Suaq Balimbing (7%) and Ketambe (17%) [DD14]. And despite the fact that getting too close and feeding is forbidden, many Bukit orangutan tour operators largely ignore this, so that they can fulfill the tourists dreams of sighting an orangutan (out of economic necessity and else). What is sad is that the vast majority of tourists come completely unprepared, unknowing or for some simply dismissing the facts, so strong is the desire for an encountering with our red cousin. Most do not realize that they are observing orangutans who do not represent their wild counterparts, but instead, orangutans remnants that we keep hostage through over habituation, jeopardizing their own survival and the survival of their babies and infants that we say we ‘love’ and marvel about. We then pursued our trek in the forest, our intent being to reach our night camp around 4 pm. Early afternoon one of our guides went scouting ahead so that we could pass the territory of the most aggressive of the semi wild orangutans in the area: Mina –often called Queen Mina. This meant that the scout would handle Mina with food so that she does not approach or even chase us. Our guides knew that we disapprove of feeding wildlife, however, in this case, they made it clear that it was necessary so that we can pass. So we followed the process. But thinking of it, I regret to not have been sharp enough to ask if we could simply avoid her territory, and get through another way. Mina is a legend, her story is sad as any of those stories goes. Someone had trapped her as an infant and kept her as a pet for three years. The mother was most likely killed as she was protecting her baby (and as any mother would right?). Mina was then rescued and brought to the Bohorok Center. There one day, she tore the tee shirt of the handler tending to her and tried to suckle the handler’s breast. Unsuccessful, she then bit the woman’s breast off. Another story is that years after the center closed, a guide once wanted to impress women tourist by mocking Mina. Mina did not react well, choked and almost killed him. A few weeks later that guide went searching for her with a machete with the intent to kill her. He hunted her for 3 nights, but thankfully clever Mina was never to be found by this revengeful individual. Mina appeared in our sight and both Dan and I respectfully watched her at a great distance. No other tourists were in the area. I kept silent watching her from afar, sad to pieces. I did not know really her personal story at the time, but looking at her rough and somber face, I truly got a sense of tragedy, which did not hit me the same way when we were visiting Pesek, Borjong and their little ones. We left fairly quickly again. Personally, I did not feel like intruding more: her baby and older infant were up watching us, having stopped their learning and socializing activities. I had enough interrupting their survival skills learning session. We moved away. A pigtail macaque slowly crossed our path and we got deeper into the forest. The semi wilds behind us, now it would be much harder to spot the wild ones we came to study and who have a radically different way of living than the semi wilds – a life in line with what they are fundamentally, rather than a life centered on entertaining us as tourists. Ecotourism, Sustainable Tourism or Wild Tourism? Reflecting upon that day, then how can we qualify the type of tourism we participated in? The rest of the day was uneventful in comparison other than coming into contacts and marvel at the myriad of insects, and plants during our forest hike and the occasional Gibbon song coming from the depth of the forest. The next trekking days exhibited great ethics w.r.t. the habitats and wildlife. It was a rough trek, but our EwA Wildness Etiquette in mind (and pocket), we stayed on trails, avoided trampling vegetation, kept our voice down, left nothing behind, got accustomed with the fauna and flora, and even caught a glimpse of the very elusive siamang. We learned a ton thanks to our very experienced guide. To recap, we were among the first visitors of Pesek and her baby. Our guide monitored us properly for the whole time. He warned us of the proper distance to be at, corrected us when we reached for our bag (I should have gotten my camera out of the bag before arriving), we did not feed, lured, we moved slowly, kept silent, or whispered when communicating between ourselves. Other visitors were not as well instructed and myself I took the courage to ask a visitor –whose guide was silent (if not encouraging)– to step away from Pesek’s baby (as he was less than 15 feet away trying to get ‘that selfie’). It is questionable that we should even have approached Borjong’s tree: there were already too many visitors on site. There is no regulation in place, but it is not an excuse. Although we did not stay long, we could and should have raised the point to our guide and the other guides present. This article and its references are raising the point. Trust us that we’ll share this as widely as possible. No matter how we look at it, some moments should be characterized as wild tourism (i.e., a form tourism based solely on interaction with wildlife and which in this case do not carry any sense of respect to the species). As a matter of fact, knowing what we know, just being there in those conditions was probably not ethical. It seems harsh, but in light of the explanations and the science behind, it’s rather clear now, no? Now we might wonder if there is such a thing as eco-tourism or even sustainable tourism when it comes to red ape tourism. We think so. According to few scientists and experts: Ecotourism has been recognized as being a potential savior for wildlife, as it can be a potentially viable industry that does not depend on physical resource extraction. It may also result in an enhanced appreciation of wildlife and ‘wild’ (undeveloped by humans) environments, education, and work opportunities for the local people. Increasing conservation awareness can also serve as a major tool to generating momentum that can then convince government officials to take action. Perhaps most importantly it can work to help change the attitudes of the local communities to better appreciate and value their environment and thus have them working to conserve their own land ([DD07],[HG14]). It is clear and accepted that wildlife tourism has to be regulated, conservation has to come to the forefront and be the driver [ME10]. Indeed wild/unregulated tourism is widely recognized to be very damaging if managed improperly. Negative impacts [ME10] include the destruction of habitats, alteration of behaviors, the altered pattern of habitat usage, disease transmission, and even increased the chance of poaching through over-habituation, most of which being observable with Bukit’s semi wilds (poaching excepted since these orangutans bring money to the area). It is also important to note that by persisting in behaving in a way that is detrimental to the Bukit’s semi wild orangutans, the price to pay is that few have been sent back to a life in captivity to prevent them from raiding or harassing tourists [OIC11]. For sure, Bukit’s great ape tourism needs to change. And we see no reason why it can’t, as the local community has the infrastructure in place, as well as they have the knowledge. We have to reiterate that we did not come as well prepared as we could have been. In a sense, you never are totally and optimally prepared when it comes to eco/wildlife tourism. Again, we did not realize that the first few hours of the first day of our 4-days jungle trek would be passing through the territories of the local semi wilds. Therefore we did not anticipate and set our mind for an encountering that day. It’s most likely a different problem than for most tourists, as sighting orangutans was not our primary goal. 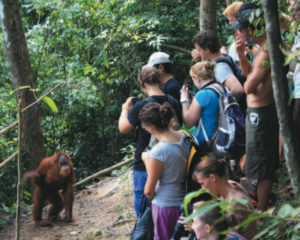 But still it was our mistake because after all this is what Bukit is known for: unregulated orangutan tourism. People come here wanting to get a sight of them “in the wild”. And that is exactly what the problem is all about with wildlife tourism: the expectation of guaranteed sightings. Our behavior and expectations as tourists have to change as well. We have to let go of this feeling of entitlement that wildlife has to be there where we want to find it for us to consume visually. Instead, we should recognize that it is a true privilege and gift to be in their presence. We keep hearing that we can’t protect what we don’t connect with through a ‘direct’ experience, there justifying a realm of human behaviors that damage that very wildlife that we say we love. We disagree: empathy and knowledge are the keys to protecting wildlife, not a direct (and too often intrusive) experience with an animal. Otherwise, the blue whale and a plethora of other species that keep away from us and that can’t be caged are doomed to be forgotten species –which is not the case. Only when scientists, wildlife experts and practitioners, and individuals come-and-work together can tourism make sense ecologically, ethically and as a result be beneficial for the local communities, for us as visitors, for the preservation and conservation of our red siblings. At Earthwise Aware, we believe that it can happen: that’s the whole point of what we’re doing. A week later we got to meet a well-known guide of the area (and the parabiologist leader of our jungle trek and science project). Together in the forest, we discussed the issues of unregulated wildlife tourism. I also explained to him what we were trying to accomplish at Earthwise Aware with raising the personal ethics of individuals and organizations including those of wildlife tourists and tour experts –those very same people that we had seen approaching the orangutans as in a trance (and understandably so), forgetting or dismissing in the moment the price paid by Pesek, Borjong and Mina and their infants. Our guide acquiesced and told me how important our work is. If you are planning to go and visit wild or semi wild orangutans anywhere they remain, please take the time to check and follow our Great Apes Rules. Help protecting them where they were meant to live and thrive. Thanks! 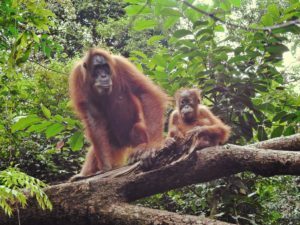 [DD14] The Impact of Tourism on the Behavior of Rehabilitated Orangutans (Pongo abelii) in Bukit Lawang, North Sumatra, Indonesia by Dellatore, D.F. & al. (2014). In Primate Tourism: A Tool for Conservation? by Russon, A. & al. (2014). [OIC11] Human Orangutan Conflict Monitoring and Mitigation in North Sumatra by Orangutan Information Centre (2011). Unpublished final grant report to BOS Canada, Toronto, Canada. [HZ03] Emerging Human Infectious Diseases: Anthroponoses, Zoonoses, and Sapronoses. Hubálek, Z. in Emerging Infectious Diseases. 2003;9(3):403-404. Thank you for this article and your work. We recently returned from a 1 day trek in Bukit Lawang, August 2018. I was unprepared for the experience of the sightings and feel rather naive about the experience. Reading up further now as a result. I was awestruck by the sightings, and did not expect to see as many as we did. They are impressive and it is difficult not to be spell bound/excited in their presence and to follow our guides gleefully through the jungle. In hindsight, our experience was not as ethical as yours. 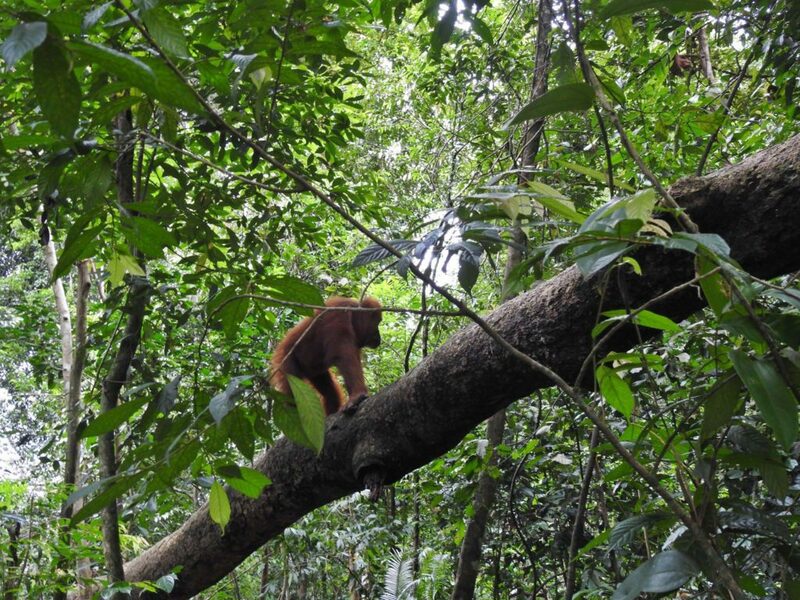 Our group went off trail, and orangutangs were called down from their trees, even lured with fruit. There were large groups of tourists taking pictures and videos. We were chased away by females looking for food, and a guide ended up feeding a female to prevent her from getting close to us as we were rushed away. The term Mina was used, but I am not sure whether or not it was her. We were not “introduced” to the orangutangs as individuals, but the guides knew their personalities, and acted based on their moods to give us “better” sightings. Groups joined up and seperated and guides relied on each other to take care of the tourists and themselves. In general, and speaking for myself, there is a lot of ignorance on the topic.Given the flow of tourists, the popularity of the location on blogs, not to mention the reliance by the community on this sort of “eco” tourism, I do not see this model changing without a concerted effort from the community, the government and tourists. The only regulation I saw was in the price, and a uniform for guides. I felt the presence of the encroaching palm trees and saw sap draining for rubber, along with the basic conditions of the surrounding community. I feel a great sorrow that perhaps there is no motivation to transform in this frontier space. That hope for these creatures lies beyond the boundary you can trek in 2 day, where the truly wild orangutangs are, and that it is a matter of time before we as humans encroach further. Not always maliciously, but ignorantly, enthusiasticly and selfishly. Hi Marta, Thanks for the feedback, and for the appreciation of our work! I hear you and agree with you. I don’t see signs of changes any time soon for that area either. Keeping raising awareness, sharing experiences and recognizing the issues, and then voicing out the need for a better handling of ourselves is important. I really appreciate your take on this issue and your humility. Humility is what we remind ourselves of every day: we don’t know it all – we can’t know it all even – so remembering this, listening, coming as prepared as we can, spreading the word is what makes you and us agents of change. One of the reasons why our personal experience might have been better is that we picked carefully the company knowing about those ethics problems with great apes tourism. We actually assessed the trek company before the trip, and we did not hide about our wildlife ethics work. In short, we made sure that there was no contact, no luring, and an as-ethical as possible experience (as possible at least from our little trek party). We made a few mistakes for sure still (we tried to minimize our impact for sure), yet we were on alert a good chunk of the time, and that sent a message to the tour guides who appreciated this. Our approach for sure did not change the behavior of the other parties around us but it enabled good discussions with different people over there, and showed us that there are people who genuinely want to do good things with proper information and ethics in mind (from the tourist side, as well as from the operation side). That was definitely worth it: this article is a tribute to this, as well as is EwA’s Great Apes Rules that we developed with the help of experts as an outcome of our work over there and in Africa (https://tinyurl.com/ewa-great-apes-rules)! I don’t think tourists think too much about their trips. It’s a temple one day, orangutans the next, then snorkelling the day after. There is not a lot of thought going on. People are, after all, on holiday. The same tourists in, say, the USA or UK national parks don’t behave the same way because there are clear rules & authority about how to behave in the jungle. Guides who are more responsible find it easy to instruct tourists on how to behave, even those tourists that arrive knowing nothing. As I was planning on visiting Gunung Leuser as well as parts of Borneo, I started to worry about becoming part of irresponsible, unregulated tourism. I love and respect orangutans as much as any living creature and because of that I would never want to be part of any activity that harms any animal in any way. I am researching ever aspect. I wanted to visit these places to experience the world as it was meant to be. But there are times when I wonder if I should stay away. Unfortunately, this “wild” tourism, unchecked is not better that the palm oil plantation next door. What can I do to help? How can I make a difference?! Thanks, Joanna for your message. Thanks again for your message. Have a wonderful rest of the day. During my research for the article, Ecotourism is the Savior of Nature, we came across your website and find that really helpful for my article as well as the reader we are targeting. In order to provide the best available information on the internet.